Simple and practical homemade gifts…the only kind I can handle! My mom was a super crafter. She had entire “craft room” with big shelves of totes filled with fabric, plus two of every craft supply found at Hobby Lobby. I loved looking through all her supplies, and I loved admiring all the detailed crafts she was making for people. She made everything from hand-pieced quilts to elaborate counted cross-stitch. Everything she made was gorgeous. You’d think I would have the same crafty genes as my talented mother. You’d think. Laura only got the cooking genes. These are also good genes to have, but they don’t have the patience or the skill to turn out beautiful crafts. I’ve come to terms with it. I will forever admire the handiwork of others while I set out plates of homemade muffins. It’s a win-win. 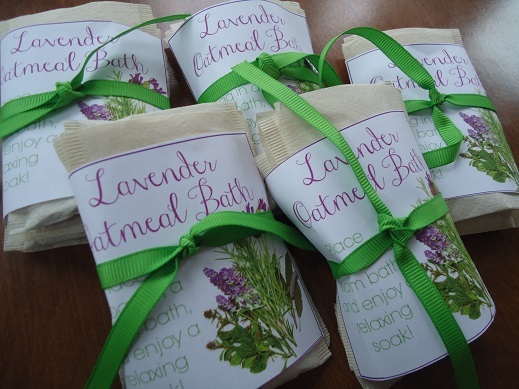 First I made the most adorable Lavender Oatmeal Bath Tea Bags (adapted from The Humbled Homemaker). This craft consists of mixing three simple ingredients, funneling the mixture into tea bags, ironing the tea bags closed, and then tying a ribbon around a few bags for a gift. Do not the let ironing step throw you off!! This is actually the step I loved the most, and I hate ironing. It’s just that ironing the tea bag closed made me feel like an actual crafter. Plus it was fun to see that the little flap on the tea bag sealed when ironed for 8 seconds. I am now a professional tea bag ironer! I want to make more of these just so I can iron tea bags. Pulse ingredients together in a blender until they are well combined and in small pieces. Use a funnel to transfer 1- 1 1/2 Tablespoon mixture to small tea bags. Fold down tea-bag flap and press to seal with a hot iron (like a boss). 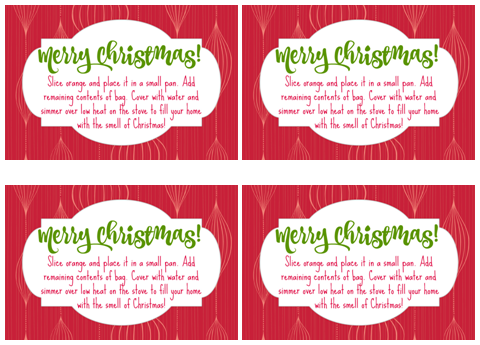 Tie a few tea bags together along with the free printable gift tag below. 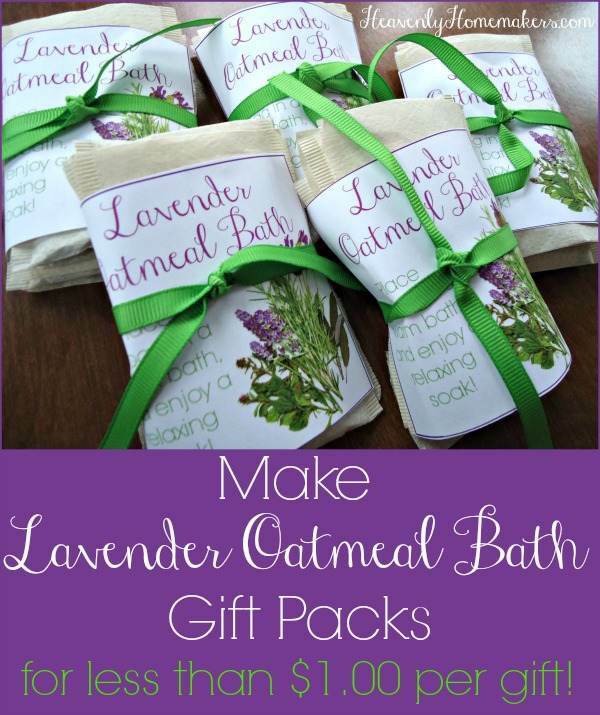 This recipe makes about 20 Lavender Oatmeal Bath Bags, which is enough for 5 groups of 4 tea bags. I realize you could have done the math on that yourself, but it is holiday time. We all have enough to think about right now. Today I shall make crafts and do short division. I am on fire! 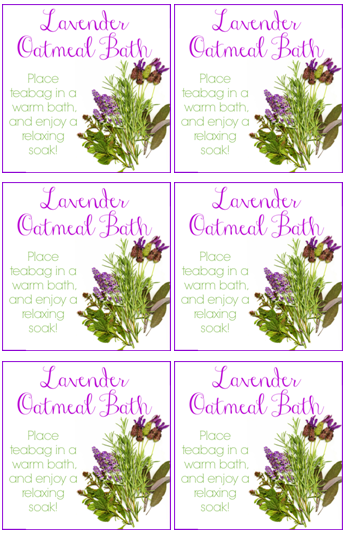 Download FREE Lavender Oatmeal Bath Tags Here. After my bath pouches were complete, I spent about five minutes pretending that putting cranberries and oranges into cellophane bags is actually a craft. The “star anise” in this recipe is optional (for those who think anise smells like a jelly bean gone wrong). But if you ask me, the anise stars triple the cuteness value of these pouches. Place all ingredients in a bag. (I used these Clear Cellophane Bags.) Tie up with a ribbon and a free printable gift tag below. 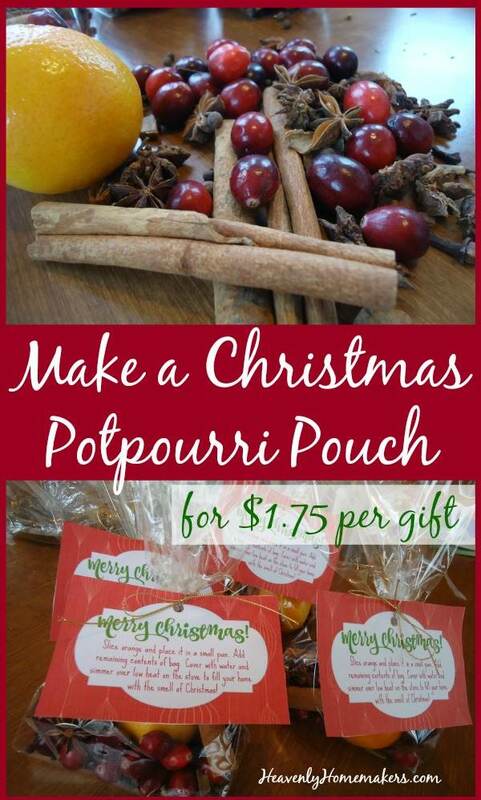 Download FREE Christmas Potpourri Pouch Gift Tags Here. Finally, I found a way to iron more tea bags (be very happy for me). I had a lovely pack of Chai Tea from Olive Nation. I researched how to make the awesome Chai Tea Drink people rave about, then put together some Chai Tea Kits. Total cost per gift set: 98¢. Getting to once again experience the ironing of the tea bags: Priceless. Funnel 1 -1 1/2 Tablespoons Chai Tea into a tea bag. Iron flap down to seal(!!!). 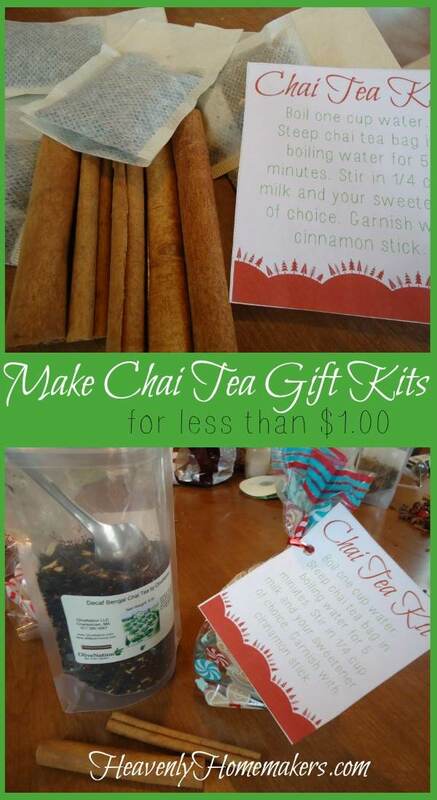 Place a few prepared tea bags along with 3-4 Cinnamon Sticks into a small gift bag. Tie with a ribbon and a free printable gift tag below. 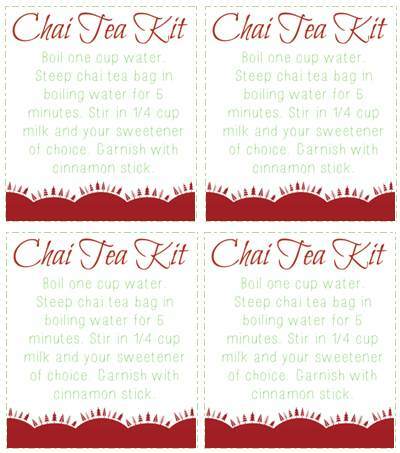 Download FREE Chai Tea Kit Gift Tags Here. I had plenty of ribbon on hand, as well as a big bag of Epsom Salt from Walmart. I got most of the remaining (really cool) supplies for these crafts through Amazon or Olive Nation. As an extra special treat, Olive Nation is giving us all 10% off any size order! 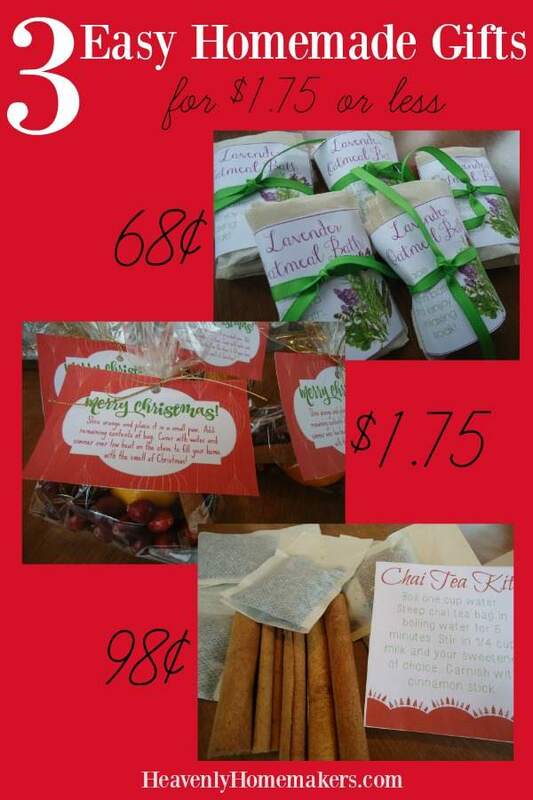 Use the code CINNAMONGIFTS for the discount. Plus, if your order reaches $50, you’ll receive free shipping. AND!!! Your order of $50 or more entitles you to a free gift at check-out!! You can choose from any that they offer, but you should know that for this special promotion, they put together an extra big package of free cinnamon sticks – just for us! (It’s a pack of 10!) For all the fun gift-making purposes mentioned in this post, I’d pick that freebie if I were you. I shall now continue to find more excuses to iron tea bags. I got Oolong Orange Blossom Tea in my Olive Nation order last week, so I’ll probably need to play with that. Beyond tea and tea bags, I made homemade Apple Cider in the Crock Pot last week with my cinnamon sticks and will be sharing the recipe soon. This time of year smells so good!!! Are you making gifts this year? Are you a crafter? How many gifts do these make each? Also how much to order for each recipe? Such as the lavendar, would the 1 oz bag be enough for the 1/2 cup called for in recipe? Thank you! The one ounce of lavender would be enough for a double batch of the Lavender Oatmeal Bath recipe. Laura – I despise crafts, but this…I can do. However, your link for tea bags isn’t linking. There are too many options on Amazon and I don’t want to research :). Can you share the link or the brand you used? I won’t see you this weekend for basketball, but think of you daily! Love your ideas! We mostly do handmade for Christmas gifts. This year we may do some mixes in a jar (including some for gluten free friends) and homemade ~ no corn syrup ~ caramel popcorn too. Thanks to my husband’s genes, our kiddos are pretty crafty and come up with the neatest ideas! Check out our family shop of handmade goodies on Etsy under Myers House Handcrafts! Hope your Thanksgiving sniffle is going away!